Janella’s Stress Belly Week: The MICROBIOME. Are you looking after yours? Eat easy to digest foods, 70% of which should be plant-based, and relax! 1. Plant-heavy diets are especially helpful for improving your microbial diversity because plants give your microbes something to chew on, to break down, to digest and extract the nutrients from. 2. Avoid Antibiotics, unless absolutely necessary. 3. Avoid non-organic meat, due to the antibiotics they’re given, plus the GMO soy and corn they’re feed. Avoid also farmed salmon. 4. Don’t kill off healthy microbes with foods that might mess up a healthy microbial balance. Topping the list of microbe-murdering bad guys are processed foods, genetically modified anything, sugar and wheat. 5. Open the windows and let in the microbes – into your home, your car, your office – the more, the better. 6. No anti-bacterial soaps, wipes or detergents. Also avoid chlorine in tap water. 8. Prebiotics: These are non-digestible short-chain fatty acids (SCFA’s, also know as Resistant Starch) that help your good bacteria flourish. To get your dose, try eating more artichokes, garlic, beans, oats, onions, cold potatoes and white rice and asparagus. 9. Get outside in the garden. 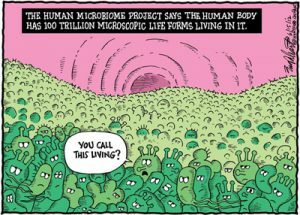 Do anything that will connect you and your immune system with the trillions of microbes in the soil. 10. Digestive Enzymes: Take 20 minutes before you eat. 12. Chew: Good digestion starts in the mouth. Practice Mindful Eating – that is, try to remain present. Avoid also multi-tasking whilst you’re eating. Do one thing at time. 13. Overnight fasting to give your belly a break.Try 10 hours without food, say from 9pm-7am, and avoid eating 2 hours before bed. 14. Reduce Stress: An agitated brain can present in the gut with stress-induced GI disorders. 15. Take herbal medicine to help repair the gut and reduce candida and nasty bacteria: Chamomile, Nigella, Fennel, Fenugreek, Cinnamon, Ginger, Kawakawa, Horopito, Barberry, Dandelion Root, Marshmallow, Pau D’Arco, Thuja. 16. Foods to Avoid: Reduce animal products unless fermented into yoghurt, lubne, kefir or buttermilk; too many nuts, eggs, coffee and alcohol. Alcohol can kill off important bacteria necessary for healthy digestive function. 17. Eat organic and preferably local foods whenever possible. Foods grown with pesticides and GMO technology will destroy your gut. 18. Eat bitter foods: Rocket or Dandelion leaves, or use herbal aperitifs or medicine before you eat. Gentian or Swedish Bitters are helpful.